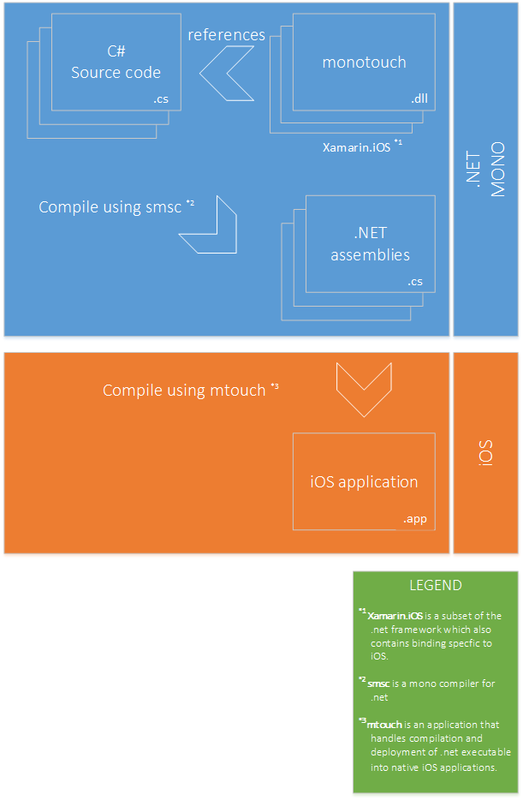 How does Xamarin.IOS aka monotouch work? Mono is an open source implementation of the .NET Framework which can run across multiple operating systems, Windows, Linux and OSX. Mono is based on ECMA standards and is ABI (application binary interface) compatible with ECMA’s Common language infrastructure (CLI). Xamarin.iOS compiles c# source code against a special subset of the mono framework. This cut down version of the mono framework includes additional libraries which allow access to iOS platform specific features. The Xamarin.iOS compiler, smsc, takes source code and compiles it into an intermediate language, ECMA CIL (common intermediate language), however it does not produce ECMA ABI compatible binaries unlike the normal mono compiler, gmcs or dmsc. This means any 3rd party .Net libraries you want to include in your application will need to be recompiled against the Xamarin.iOS subset of the mono framework using smsc. Once a Xamarin.iOS application has been compiled into CIL it needs to be compiled again into native machine code that can run on an iOS device. This process is carried out by the SDK tool ‘mtouch’, the result of which is an application bundle that can be deployed to either the iOS simulator or an actual iOS device, such as an iPhone or iPad. Due to restrictions placed by Apple, the iOS kernel will not allow programs to generate code at runtime. This restriction has severe implications for software systems that run inside a virtual machine using just-in-time compilation. Just-in-time compilation takes the intermediate code, for example mono CIL and compiles it at runtime into machine code. This machine code is compatible for the device it is running on at the time of execution.